Recently Facebook rolled out a new feature that enabled videos to be played automatically on its android app’s feed. Since the app needs internet access to download and play videos, unless you have an unlimited internet data connection, the auto play video feature is going to add to your internet usage charges. Fortunately Facebook has provided an option to turn of the video auto play feature when you are connected to an cellular data connection. However there is no way you can turn off this feature permanently. You can either turn off this feature while using a cellular data connection or keep it enabled whenever you are connected to a Wi-Fi network. 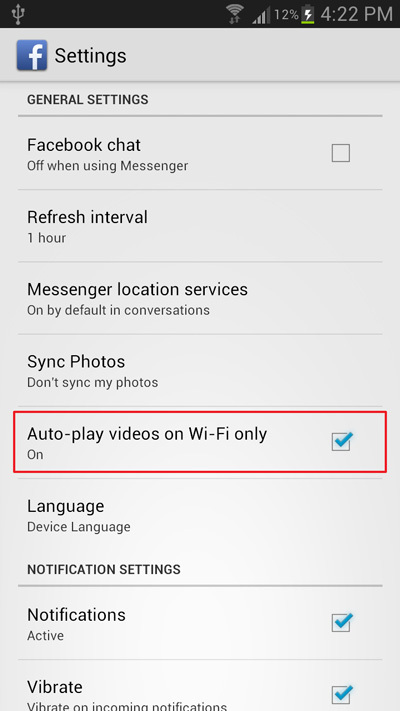 For those who want to turn off this feature whenever you are connected to a cellular data connection, the instructions below will show you how you can disable the auto play video feature on the Facebook for android app, . Step 1: Open the Facebook for android app and navigate to the settings. That’s it, now the Facebook for android app won’t automatically play videos on your Facebook feed if you’re connected to a cellular data connection. One more thing that I have noticed is, all the videos playing automatically on the Facebook for android app start playing with the sound muted. Until and unless you notice these videos playing, these videos will keep on eating up your cellular internet data.